NOW IMPROVED! Now when you buy our iRiff of AIR COLLISION, our animated Intro and Epilogue videos are included right in the package! No more having to look them up on YouTube! 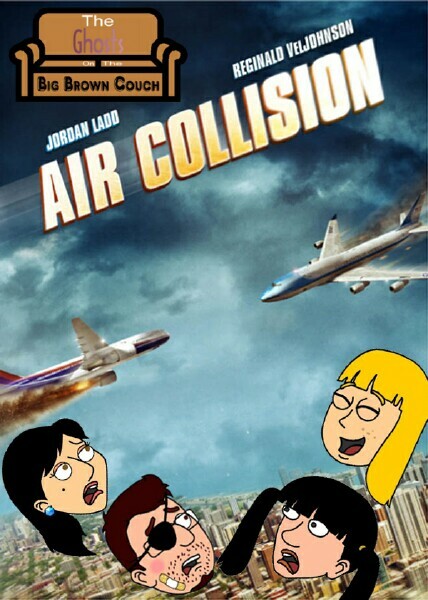 Not only that, but you're getting more for less: our AIR COLLISION iRiff is now on sale for only 75 cents! Note: To get the full Ghosts experience, after payment be sure to download the file named "Air Collision - GOTBBC Ep. 3 Deluxe Packaging.zip". That is the new updated set of files. As Johnny settles into his new living arrangements with three lady ghosts, he receives a rude awakening that leads to the whole gang watching AIR COLLISION, The Asylum's 2012 foray into exciting, big-budget disaster film. Watch as an ultra-modern computer (which looks not quite as sophisticated as a Commodore 64) accidentally sets Air Force One on a doomsday course with an airliner filled with passengers, one or two of whom you actually might not want to die. You will be in awe of the high-profile Hollywood cast, led by that one guy who used to act with Urkel on FAMILY MATTERS. You will gasp in astonishment that a director could fit so many "one person talking to another person through a closed door" scenes into just ONE movie. You will scratch your head with confusion at the fact that every satellite in Earth orbit seems to be permanently parked above the city of Cleveland. And you will be on the edge of your seat in anticipation, wondering if you'll actually get to see the President of the United States slamming into something this time, or if it will just remain a rumor, as it mainly did during the Clinton administration. 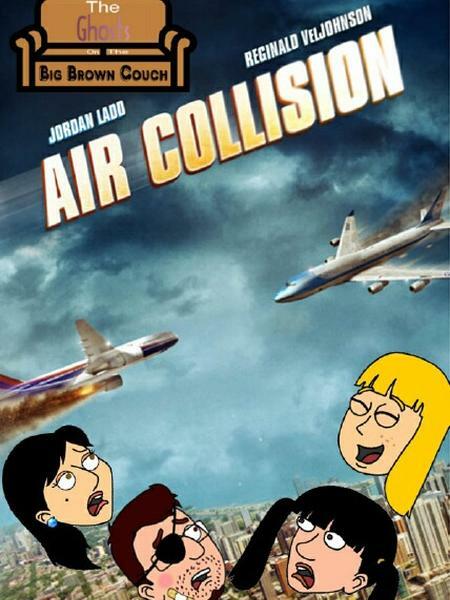 Join The Ghosts On The Big Brown Couch as they tackle AIR COLLISION. It will be the most worthwhile money you ever spent (if you don't count that business behind the gas station back in '98, the details of which we promise not to divulge if you go ahead and buy this audio track). Technical mumbo-jumbo: This iRiff is designed for the NTSC video of AIR COLLISION. A Sync file is included for use with the official RiffTrax RiffPlayer. As always, of course, additional synching instructions are included for those who wish to synch manually, or who may be watching a non-DVD copy of the film. This episode of Ghosts On The Big Brown Couch comes with a video introduction AND epilogue, showing the events of the evening before and after the viewing of the awful film. More bang for your (less than a) buck! Warning: There may be a single F-bomb hidden somewhere among the iRiff for AIR COLLISION, as one of the ghosts is a complete potty mouth. But what can we do? It's not like you can send a ghost to bed without supper.